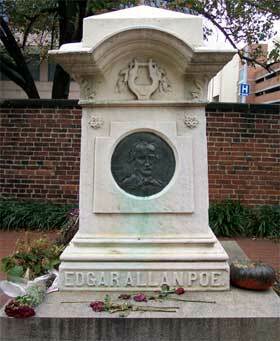 This Saturday will mark the 199th birthday of Edgar Allan Poe. So-what does this have to do with Lizzie Borden? Not much actually, except for that Poe is widely regarded as the Father of Detective Fiction and the master of the whodunnit and how. Detective fiction is widely considered to have begun in 1841 with the publication of “The Murders in the Rue Morgue”, a short story by Edgar Allan Poe featuring “the first fictional detective, the eccentric and brilliant C. Auguste Dupin. 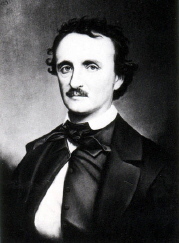 Many authors followed after Poe’s distinctive style including Sir Arthur Conan Doyle and Agatha Christie to name the two best-selling authors of the genre. Lizzie Borden would surely have read Poe’s works. The city of Baltimore tries to lay claim to the genius, but Poe was actually born in Boston, Massachusetts and led a short but dramatic life. His actual cause of death is uncertain, but 40 years of not taking very good care of his health took a toll in the end- that and his deep sorrow at losing his young wife to consumption just two years before he died in 1849. The Poe House in Baltimore observes the birthday every year with plays, toasts, readings of Poe’s works, and the famous Poe Toaster- a mystery man who slips into the cemetery on Greene Street with three roses and a bottle of cognac and leaves them on Poe’s grave in the dead of night. His identity is a secret well-guarded by the curator of Poe House. 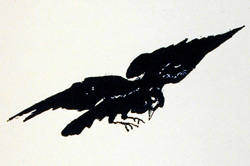 Lizzie was as silent and cryptic in court as that famous bird in Poe’s most beloved work.